The Islanders have finally put pen to paper with their captain on Tuesday, bringing Doug Weight back into the fold for another year. Weight signed a 1-year deal with a base salary of $850,000 and some bonuses (which were not disclosed). Weight will play a key role in the development of the team's young players like John Tavares, Josh Bailey and others, not to mention putting in some good minutes for the Islanders, who could use the depth down the middle of the ice. Weight's 2010 season was marred by injury, dealing with shoulder problems for the back half of the year. Weight only played in 36 games for the Islanders before undergoing shoulder surgery in March. In those 36 games, Weight scored 1 goal and added 16 assists for 17 points, which doesn't look good as a total, but his scoring rate of 0.47 points per game isn't too bad and in a 75-game season, discounting for possible injuries, that would be good for 35 points. Neither of the publications I have for pool projections has anything for Weight and his 2011 campaign, so it might be wise to stay away from him this season, unless he has some remarkable start to the year, picking him up mid-season. In what has been branded by the Score in the past, the Sports Forecaster 2010-'11 NHL Preview and Fantasy Guide has been one of my favourite reads leading up to drafts, because they do a pretty good job with younger players. The top 500 players and 50 goalies pull-out is also pretty good, but it is in such small print, it doesn't really work well in the dim lighting of the bar, once we're in full draft mode and someone decides to turn on the mood lighting. The Forecaster is definitely going out on a limb this season by selecting Alex Ovechkin as the top scorer in the league this season. Okay, maybe they aren't, but they are suggesting that this is going to be one hell of a race between Ovechkin and Sidney Crosby, both eclipsing the 120-point mark this year. Ovechkin is listed at 128 points in their forecast, while Crosby is not far behind at 123 points. As those two will go, as will their partners in crime, with Nicklas Backstrom listed at 107 points and Evgeni Malkin at 97 points. That is definitely a plausible top four picks in anyone's draft, if you ask me. Also, in terms of partners in crime, the Sedin twins come in 5th and 6th, Daniel Sedin coming in with 37 goals and Henrik Sedin with 30 goals, both with 96 points each. From the goaltending side of things, there are some pretty conservative numbers in their predictions, as if to say parity will reign supreme in 2011. Ryan Miller is the only 40-game winner on the list and leads all goalies in point projections with 92 points. That doesn't even crack their top 10 players, but close otherwise. Roberto Luongo shows a solid 2nd place with 86 points, as does Jaroslav Halak (but with less wins). Having Halak this high is quite the gamble, I really wonder how many people will bite on that and how well he'll do for them. Martin Brodeur, Ilya Bryzgalov, Miikka Kiprusoff and Pekka Rinne all have 84 points in their projections, which doesn't surprise me, while Steve Mason rebounds with 82 points. Some other quick surprises on the goalie list has Thomas Greiss outdueling Antero Niittymaki in San Jose for the number one job, Ondrej Pavelec doing the same to Chris Mason and Johan Hedberg only getting 10 points in New Jersey. Those are all worth a raise of the eyebrow to me, at the very least. On defense, it really is hard not to like Mike Green at the top of the chart, especially with the potential top scorer in the league on his team. Those are going to be some very valuable power play points that top Green off at 79 points in 2011. Drew Doughty ranks second, no surprise to me, with 66 points and I think that kind of effort will lead him pretty close to a Norris Trophy, if they hold out to be true. Duncan Keith, Dan Boyle, Lubomir Visnovsky, Shea Weber, Chris Pronger, Mark Streit, Alex Edler and Erik Johnson are all scheduled to hit over 50 points, which looks about right. I also like inclusions to the 45+ points players like John Carlson in Washington and Keith Yandle in Phoenix. Finally, a little bit on the rookie class. The Forecaster does not have a great side-by-side comparison of the rookie class in its publication, they are just sprinkled through the top 500 skaters, so it takes some digging. Jordan Eberle leads this class again in projections with 52 points in Edmonton, followed by Taylor Hall with 46 points, John Carlson has 45 points, Tyler Ennis in Buffalo has 44 points, Logan Couture in San Jose has 43 points, PK Subban has 43 points, Michael Grabner has 41 points in Florida, as does Tyler Seguin in Boston and Magnus Paajarvi-Svensson has 29 points. It's an interesting rookie class, I wouldn't mind seeing a bunch in the draft this year. Again, I'm not sure I would use these guides to the letter, but they do provide good reference to some players and a subtle reminder not to forget others. Since I am not holding the 28th of September, we still have training camps to assess before making some final projections for the coming season. Monday morning continues to see some more minor depth signings, as the Rangers signed unrestricted free agent forward Tim Kennedy to a new contract. Kennedy, who had an arbitration case settled and signed, had that deal bought out by the Sabres, since they couldn't walk away from it, signs this new 1-year deal with the Rangers for $550,000. In 2010 with the Sabres, Kennedy scored 10 goals and added 16 assists in 78 games, ranking him 225th among forwards in scoring, which would equate to a depth pick in my draft. What needs to be taken into consideration before making Kennedy into a sleeper pick for your hockey pool team's depth is whether or not he makes the team, since the Rangers are rocking some serious depth up front and are now considered to be over the salary cap ceiling, according to my list. The 22 players on the table above now come in at an annual cap hit of $59.9 million, which is $500,000 over the ceiling and they still have to deal with Marc Staal, who is a restricted free agent this Summer. The Rangers situation does not reflect well upon them at the moment and they will likely have to find some deals to help ease the pressure on their budget. Of course, the thought that still lingers in the minds of many is that Wade Redden may find himself as the odd-man out in this situation, ranking at the bottom of the blueline pack with the highest cap hit. Word came down late on Sunday night that the Coyotes have re-signed unrestricted free agent forward Lee Stempniak to a new deal, which is reportedly for two years and will have a cap hit of $1.75 million per season, $3.5 million deal in total. The deal does come a little late in the free agent season, but it was likely key for the Coyotes to wait until the heat was down before they gave Stempniak a new deal or else it likely would have cost a lot more. The Coyotes turned what was a disappointing season for Stempniak in Toronto into a pretty good season after a trade deadline deal, giving the winger some new life and some new scoring streaks to go along with it. In Toronto, Stempniak scored 30 points (14 goals and 16 assists) in 62 games for the Leafs, but once he moved to the desert, he picked up 18 points (14 goals and 4 assists) in 18 games, turning him into an immediate fan favourite. His re-insertion into the Coyotes line-up should be a good push for the team that could use some grit and scoring at the same time. I'm not sure we should be expecting point-per-game numbers, but he should have a decent year. The Coyotes, in theory, could dress this 20-man roster and call it a team come October, but I think we all can see that there are a few bubble players that may or may not make it out of camp, but we'll wait for the professionals to decide that before anything. This 20-man roster, plus three buyouts, checks in at an annual salary cap hit of $46.5 million, which clears the salary cap floor by a comfortable margin and there are still three more names the team could add, if they feel the need to. I think we are all looking to see Kyle Turris, Brett MacLean and Oliver Ekman-Larsson perform in camp and take a likely spot on the roster. All three of them will have decent cap hits to consider as well. If Phoenix is going to add some more youth to this good skating club, then I would have to think that they would all have to be considered NHL-ready by the coaching staff, who wasn't going to have any of it last season, opting to go the more veteran route, which paid off with a playoff appearance in 2010 and obviously wants to be repeated in 2011. There have been a few changes to the team already, but with a solid goaltending tandem, a goal-scoring potential from the blueline and a lunch pail bunch of forwards, the Coyotes should be able to make a solid push. The Oilers finished off some much needed work on Sunday evening by signing restricted free agent forward Sam Gagner to a new 2-year deal, reportedly worth $4.55 million, a $2.225 million cap hit per season. The veteran of three seasons will now likely play an instrumental role in the development between some of the team's young wingers in Taylor Hall, Jordan Eberle and Magnus Paajarvi-Svensson. On a struggling Oilers team, scoring came at a real premium for their players and Gagner was no exception. He did, however, finish with 41 points (15 goals and 26 assists) in 68 games, which was good for second on the team behind Dustin Penner. With an influx of some clutch young talent coming up the pipe, the Oilers and Gagner could see a positive resurgence into the goal scoring column, which is a step in the right direction, especially if they learn to keep pucks out of their own net. In Edmonton, I would wager that the number one centre position is up for grabs come the start of training camp and it will be whoever handles their winger partners the best that will take the job. Shawn Horcoff is coming off a miserable 2010 and will desperately need to show some real touch to start earning that money he signed for in 2008. Now it comes down to the ol' dollars and sense portion of the team update, now that we see how the team is rounding out, sans their young superstars. Of course, once training camp drops, you'll see all the top prospects hit these tables as potential players to make the roster, but for now, these are the roster players I expect to be on today, because of experience and games played in 2010. This group of nine forwards, seven defense and two goalies, plus one buyout and one cap overage penalty, come in at $45.5 million against the cap. That's pretty good shape for a number of large entry-level deals still to hit these books and a big question mark hanging over top of Nikolai Khabibulin. 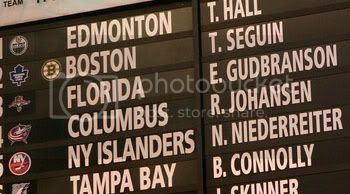 With training camp only a few weeks away, the Oilers still have some shuffling or some official paperwork still to accomplish before we can go into too much detail about how well they will do in 2011. I don't think there is too much doubt that they will improve offensively, but with Souray on the way out and some young kids manning the helm at the back, I would be curious to see how the defense fares against the rest of the Northwest Division and league. This could very well be a team that goes back to its roots and finds some high-scoring, up-tempo games, to which I have my doubts that they will be on the right end of most nights. We're just under a month away until the draft goes down at Jameson's Pub and I am getting the feeling that a few of our competitors may be new at this, so I thought I would make up a post for those who are going to be new to the event and maybe it will prove to be a refresher for those who have missed a year or just want something to read on the blog today. Now, I have the Bud Lounge booked starting at 6pm, so this is definitely for the after-work crowd, plus it is a Tuesday, so you'll want to drink away your early week blahs, rights? The last couple of years we have had the Bud Lounge at Jameson's Pub, we've generally started drafting closer to around 7pm, which gave everyone enough time to find a beer, a bite to eat and get all of their lists and documentation ready for drafting. The 17 people we've had in the past few years have taken about 2.5 to 3 hours to draft all 14 players we need, so expect to be out of the pub by about 10pm, unless you're staying for another drink or two and talking some smack with the others who have stayed. As people walk into the lounge, I usually have people sign in, pay ($50) and draw a number out of a hat to determine the draft order. I will usually have numbers from 1 to 30 in the hat, as I don't usually expect any more than that to arrive and then it's just the lowest number to the highest number to which determines the draft order. We draft in the snake format, so it is lowest to highest for one round and then the next round is highest to lowest, so there will be two picks in a row for the lowest and highest drafters. It has proved to work most effective over the years and there is no real expectation to change it. As for players, I again like to keep it really easy, which seems to keep everyone playing in a pretty good mood. Eight (8) forwards, four (4) defense and two (2) goalies is what makes up the team and all of these players can be taken at any time. You can then plan your strategy from there, deciding which players you want to take in what order. Some have wanted to get their goalies first, some wanted to corner the market in defensemen and others want to make sure they get great forwards, but that decision is up to you. Scoring in the hockey pool is also quite easy and this goes for both the draft and the selection sheet pool, which will also be available at the draft. One (1) for goals and assists (which goes for goalies as well), two (2) points for a win and another two (2) points for a credited shutout. Goalies can be credited with a shutout in a shootout loss, so I make sure those points are credited for those goalies. I do not believe in the loser/charity point in the NHL standings and I don't think they should hold true in the pool, so there is no point there for goalies. I have a list of players and all of their points, including goalies, so if you are heading to the draft and need a list of players, I can definitely provide you with one. I can send it to you in most generalized ways, but it is formed in Microsoft Excel, so if you want to play with the list and make it reflect your own expectations and projections, feel free to ask for it. A little homework goes a long ways. If you are not going to get a list from me, I would recommend finding one of the magazines that you can get at most convenience stores or even the one's online and print them out. If you want to get an Excel (or PDF) copy of my list, e-mail me by clicking this link. The NHL schedule is 27 weeks long and weeks are considered to be Monday to Sunday, all year long. The schedule does start on a Thursday night, so Week One will be from Thursday to Sunday and I believe we have a couple other shortened weeks for Christmas and the All-Star Break. During the season, there will be two periods to which we will be able to switch out some players, which I lovingly refer to as the Waiver Draft. This year, since we'll have an even number of weeks in the year, I will be holding the week-long (as that's how long these usually take) drafts via e-mail, phone, instant messaging or other to replace two players with two other players. The order will be determined by the standings after the Sunday of the previous week and it will not be a snake draft, as this usually gives a little bit more help to the teams near (or at) the bottom of the standings. Here you will be able to drop a player, who is usually injured long-term or just not producing and exchange him for a player of the same position. There are some blog posts about how the Waiver Draft actually affects the standings at the end of the year, so you can definitely gauge its importance there. This year, the Waiver Drafts will be held during Week Nine (November 29th to December 5th), with the players going live on December 6th, and Week Eighteen (January 31st to February 6th), with players going live on February 7th. As for prizes, they are generally determined after the number of participants have been decided. Last year, I was able to rustle up some jerseys for prizes for 8-week segments, which I might try to do again this year, but all of that is usually determined after the draft is done. First prizes have usually been over $500, while 3rd place usually gets their money back. That's about it. Actually writing it all out, it does look like quite a bit to remember, but I think I have everything, so there shouldn't be any excuse not to know coming in. If you stay tuned to the blog, I'll be posting all sorts of news that you will want to know going in, some stuff you won't find in those publications that were printed a month ago. If there is anything I may have forgotten, feel free to ask! If you are going to be new to the Opiated Sherpa's draft this year or you've been in the draft for the past three years, you may want to see some historical data on how the first round has played out in those years. Personally, I wanted to see how many names are the same across the board and I also wanted to see how the times have changed, even if it is only three years difference. Now, these three years have the exact same number of teams, which was way more of a coincidence more than anything, but it sure looks good when we're comparing the names on the list. I really hope that the 2010 draft day has more people than 17, but I don't think I would be sad if that is the case in the end. Sidney Crosby, Alex Ovechkin, Joe Thornton, Martin Brodeur, Dany Heatley, Roberto Luongo and Jarome Iginla are the only players to be picked in the first round in all three years and I would say there is an excellent chance that all seven players will be picked in the first round again. Miikka Kiprusoff, Jason Spezza, Pavel Datsyuk, Henrik Lundqvist, Vincent Lecavalier and Ilya Kovalchuk have all been picked twice out of the three years in the first round, but how many of these guys will be picked in the first round again? Now that you've seen three different sets of picks, are you less worried about not having the first pick overall in the pool this year? The Toronto Maple Leafs announced on Saturday afternoon that they have signed unrestricted free agent forward Clarke MacArthur to a new 1-year deal, reportedly worth $1.1 million. MacArthur split his 2010 season between the Buffalo Sabres and the Atlanta Thrashers, playing 81 games in the season and picking up 16 goals and 19 assists for 35 points. MacArthur was in a deadline day deal to the Southeast Division squad, in order to clear up some salary cap room for another signing for the Sabres. Overall, MacArthur has been toiling around the NHL for a few years, mostly in and out of the Sabres line-up, but couldn't find a great deal of consistency in their line-up. Looking at where MacArthur slots in according to points last year, he brings some much needed depth to the Maple Leafs forward ranks and at a reasonable cost to boot. According to my list, the team listed above with 11 forwards, eight defense, two goalies, a buyout and a cap overage penalty now have an annual cap hit of $60 million, which is $600,000 over top of the cap ceiling. Without a deal that sent Tomas Kaberle out of town, the Leafs will have to do some clever bookkeeping to make this work for them, especially when they need another forward to help fill a fourth line, unless they are going to run with an extra defenseman or possibly move one of their d-men up for a game. In theory, the Leafs could run with a line-up close to this, drop a defenseman down to the minors and get going, but the management of the Leafs have noted that they want to be more competitive now and I find it hard to believe that this roster is what they are thinking about going forward with. MacArthur has always been one of those bubble guys that some of the fantasy publications have been keeping in their back pocket as a guy who could possibly break out and then he would fall behind the curve in Buffalo and only figure into a few games. Well, now that he has seen Buffalo and Atlanta, played 81 games and moved to a Toronto team that is desperate for some good minutes up front, this might finally be his chance to excel as a forward. The Hockey News has him pegged for another 35-point season, but that was supposed to be with the Thrashers. The Leafs may struggle to win some games, but they should find some goals here and there, bumping up the numbers of whoever is on the first and second lines. I'll bump MacArthur up a bit, making him a little bit of a sleeper, but I won't go overboard with him, since he still plays in Toronto now. On Friday, the courts in Arizona had found Nikolai Khabibulin guilty of excessive speed, extreme DUI and DUI over 0.08 and the 37-year old goalkeeper will now await his sentencing, which is scheduled to happen on Tuesday. Khabibulin is facing a minimum of a 30-day sentence for the DUI charges in Arizona, which will give him all sorts of issues surrounding training camp, travel between USA and Canada and likely some visa issues. According to the Oilers website on Friday night, the organization and the league will be working together with Khabibulin for further actions after sentencing comes down on the charges, but until then, we will be left to speculate as to what will happen. It should be a fair bet to think that a league suspension will be handed down at the very least, but even a length is hard to determine today. There has been some chatter about invoking some clauses in a standard player contract that may be able to nix the remaining three years on his Khabibulin, but that could be an extreme decision. Until then, I don't think I'll make too many wild judgements, but I think it is a wise idea to stay away from Khabibulin in the pool draft until he has strapped the pads on and received whatever reception he'll get from NHL crowds. A news release from his agent has announced that Paul Kariya will not be participating in the 2010/'11 season after having an evaluation done by a specialist revealing that he is suffering from post-concussion syndrome and that he will not be fit to play this season. Kariya was on the list of top available unrestricted free agents remaining this Summer after having 43 points (18 goals and 25 assists) in 75 games with the Blues and was rumoured to be heading back to Anaheim to join his first NHL team, but with these new health issues and a halt to play, we can officially strike him from our lists for the draft. Definitely not a groundbreaking deal, by any means, but the Toronto Maple Leafs were able to secure a little extra depth for their blueline by acquiring Matt Lashoff from the Lightning for a couple of prospect forwards on Friday. Lashoff, who has played a minor part in four seasons between Boston and Tampa Bay doesn't have a great deal of NHL experience, but he has played in 63 career games, registering 15 career points in those games, so there has to be some attraction to him for the Leafs. Toronto is already fairly stacked on the blueline, but some tested minor-league depth should be a plus for the team. The Lightning add to their depth by picking up two minor-league forwards, both of which are on the final year of the entry-level deals. Not too sure what their impact will be with the Lightning, but they are now in reserve, if needed. I would not call any of these guys roster players today, so their cap hits are not worth mentioning today, but you might see these names at camp, finding their depth role with the club. News surfaced on Thursday that Jordan Staal has not quite recovered fully from the severed tendon injury he suffered in the playoffs last Spring, when he collided awkwardly with the Canadiens' PK Subban. Staal suffered the severed tendon in his foot and was only out of the line-up for two games before returning to action. The news article that was posted on Thursday had said that Staal would be visiting team doctors to have an idea what his timetable to return to the ice will be, since he has not been able to do any skating this Summer, thanks to this injury and the surgery he had to have to repair it. Until there is a definitive word as to whether or not Staal will miss any of training camp or the start of the season, there isn't really any need to panic, unless you have already drafted your team and you are banking on Staal to be a big contributor this year. If you haven't drafted yet, you may want to flag Staal as a potential injury risk to start the season and check back with him closer to your draft date. The Dallas Stars announced on Thursday afternoon that they have re-signed restricted free agent defenseman Niklas Grossman to a new 2-year deal, said to be worth $3.25 million, a $1.625 million cap hit per season. The 25-year old Swede played in 71 games for the Stars in 2010, picking up 7 assists in the process and logged quite a few minutes when leaned upon to do so. The 4-year veteran of the club will not likely be a good fantasy option for the draft this year, but he might be figuring onto the Selection Sheet this year, as he might slide into the role of the 4th or 5th defenseman for the Stars this season. The Tampa Bay Lightning made a second signing on Wednesday, adding veteran defenseman Randy Jones into the mix, signing him to a 1-year deal worth $1 million. This signing doesn't come as any surprise to me, as I posted in the Downie blog yesterday, I had a feeling that GM Steve Yzerman would use some of their cap space to go after some of the veteran defensive talent on the free agent market. The 2010 season was a bit of a rough one for Jones, starting the season in the Flyers minor system, he was claimed off of waivers by the Kings to help fill a gap or two, but found some limited success in with some injury problems. He finished the season with 48 games under his belt, scoring 5 goals and adding 16 assists with the Kings, which was actually good enough for 83rd among defensemen and he's ranked 2nd among Lightning defensemen going into this season. I would expect Jones to be on the 3-4 pairing for the Lightning, also picking up plenty of power play time, likely on the second unit, but only time will tell for sure. The Los Angeles Kings have added to their blueline on Wednesday by adding Willie Mitchell, who was an unrestricted free agent this Summer. Mitchell's stock as a defensive defenseman attracted a number of suitors in this off-season, but a 2-year deal worth $7 million from the Kings was good enough to send him down to California for the upcoming season. Mitchell's 2010 season with the Canucks was shortened to only 48 games thanks to a concussion, but in those 48 games, he managed to pot 4 goals and 8 assists, which gives him the 3rd-best scoring rate among Kings defensemen currently on the roster. A full season could see him hovering around the 20-point mark, especially with the amount of offense the Kings boast up front, but the word concussion looms large in making the decision to pick him or not. The consensus may be that the Kings overpaid for Mitchell, but defensively he is just that good. The $3.5 million cap hit does lift their number up higher, but as of right now, I have the Kings with 19 players and one buyout for $52.3 million, leaving them $7.1 million to the cap ceiling for three forwards and probably one defenseman, to help fill the void that Matt Greene leaves behind with injury. If the Kings are poised to spend to the cap ceiling, they might be able to find an option or two on the market still. The top free agents are starting to fall again on both sides of the restricted/unrestricted fence now, yesterday saw Hornqvist sign with the Preds and Torres sign with the Canucks, this morning we have Steve Downie signing a new deal with the Lightning. Downie, a restricted free agent, signed a new 2-year deal, reportedly worth $3.7 million, a $1.85 million salary cap hit in the end. In 2010, Downie really started to break out with the Lightning, getting matched up on a line with Steven Stamkos and Martin St. Louis, which really helped push his stock up in the end. He finished the season with 22 goals and 24 assists (for 46 points) in 79 games with the Lightning, also adding 208 penalty minutes, making him a great fantasy threat in the 2011 season. I think I will be giving Downie a bit of a boost, especially since reuniting the chemistry of that line seems like a no-brainer. The Hockey News Pool Guide has Downie projected for 51 points in 2011 and in some respects, that sounds about right, especially for the number of penalties he takes in a year. I think I had a team update on about a week ago, but adding Downie to the line-up is a good thing that should be explored. The Lightning are doing well to fit everyone under their budget for the coming season and adding a sub $2 million per year deal only makes the cap hit look better. Currently, the Lightning squad that is listed above comes in at a cap hit of $48.9 million, well below the cap ceiling for the year. The highest ranking restricted free agent they have left on their books is defenseman Paul Ranger and if he does eventually sign, he'll be a bargain basement guy as well. I wouldn't be surprised to see the Lightning go after some of the veteran talent that is still on the unrestricted free agent market, especially with prices dropping significantly. Late on Monday night, news broke that the Canucks have signed unrestricted free agent forward Raffi Torres to a 1-year deal worth $1 million. Torres was ranked on my last top 20 unrestricted free agents post, down around the middle of the pack, which should make him a real solid pick-up, especially at a $1 million salary. The grinding winger may be a good fit for the Canucks 3rd line in October. In 2010, Torres split time between the Columbus Blue Jackets and the Buffalo Sabres, having being dealt as a rental player at the trade deadline in March. In 74 games, Torres potted 19 goals and 17 assists between the two teams, giving him 36 points and ranked him 161st among forwards. In Columbus, Torres was logging some solid minutes for the Blue Jackets, but the role he had in Buffalo after a lack of production didn't give him as many minutes and everything suffered after that. With the Canucks he'll likely be getting some in-between minutes, likely with a centre like Manny Malhotra, so there could be a pretty good match there. The Canucks are definitely going to be a cap team in the 2011 season and they are currently sitting over top of the salary cap ceiling with the squad that you see above. I have finally added Cory Schneider to the mix, as it doesn't look like the Canucks are in the market for any more goaltending and both Alex Burrows and Sami Salo are in red, as they are both expected to start the season on the injured reserve. With every player present and accounted for, the 23-man roster above, plus a small cap overage penalty, the Canucks now stand at $62.5 million, $3.1 million over top of the ceiling. Some clever math will likely push that number down, but that is where they stand right now. The Nashville Predators have now locked up one of their key restricted free agents by signing Patric Hornqvist to a new 1-year deal, said to be worth $9.25 million over the duration, which works out to be a $3.083 million cap hit per season. This leaves the Predators with only one more key RFA left to sign in this off-season, Cody Franson, and then the team should have a rounded out feel by the time training camp rolls around. Hornqvist really came out of the shadows in the 2010 season, scoring 30 goals and adding 21 assists in 80 games for the Predators, in his first full season with the club. His 51 points was good enough for 115th in pool scoring, 86th among forwards and will likely be a desired player for most hockey pools as a player for growth. The layout of the Predators forwards has changed in this off-season, adding some more speed in Matthew Lombardi and Sergei Kostitsyn, which may have some benefits to players like Hornqivst, but neither one of these additions are known for their consistency, so I wouldn't be putting a great deal of stock in improvements, because of new talent. I now have the Predators with a projected roster of 19 players, no buyouts or penalties on the books, at an annual salary cap hit of $45.5 million. The Predators will need to fill a couple defenseman spots and the back-up goalie role, to which they have some talent in their ranks to work with, some of which are already signed on. There are also a couple of bubble veteran players not listed, due to minimal NHL games, but they should be able to get a good run in camp. The Predators are in great shape going into camp. Pronger Not Ready for Camp?